Corbieres Rouge Grande Cuvee Castelmaure is made from 45% Grenache (20 year old), 45% Syrah (20 year old), 10% Carignan (40 year old). 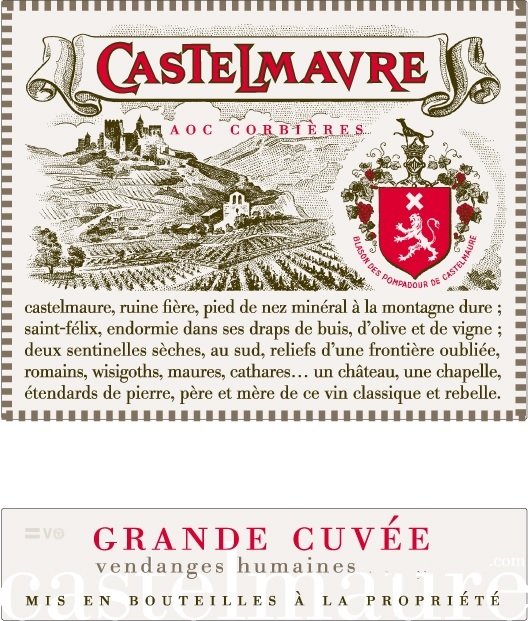 In the early 1990’s, Castelmaure began experimenting with a Prestige Cuvée of Corbières. This wine has become known as “Grande Cuvée” and is made with the help of the winemaking team of Tardieu-Laurent. Vinification: destemming, pneumatic press, end of fermentation at 25 degrees C; two racking; aging in tank then in 220 Liter Bordeaux barrels for 10-12 months. Egg fining, slight filtration.. Deep and intense color, powerful aromas of dark berry fruit, prune and coffee nuances, and a persistent finish. S.C.V. Castelmaure was founded in the 1920’s and today consists of 65 members, of which 15 bring 85% of the production. The winery is located in the unofficial Corbieres cru site of Durban (there are 11 unofficial Cru’s in Corbieres), which will become soon an official Cru together with Boutenac and Alaric. The Serre mountain in the south protects the little plateau of Castelmaure from the off weather patterns of the Mediterranean sea. Patrick de Marien, the president of the cave, and Bernard Pueyo, the director, work in conjunction with Tardieu/Laurent in trying to produce wines of higher quality each year. The AOC Corbieres was created in 1985 and measures 23,000 hectares (56,810 acres). The appellation requires a minimum of two grapes in a wine blend. The co-op farms 350 hectares (868 acres) around the tiny hamlet of Embres et Castelmaure. The 760 parcels are inspected and the characteristics recorded on computer. Each parcel is supervised individually by a technician who dedicates his time to this task. They have re-learned to prune, plough, check yields, sort, select, with a permanent focus on the respect of the environment. All the grapes are harvested by hand. In the cellar, vats hygiene, temperature control, ultramodern pressing contribute to a better expression of the terroir. Castelmaure produces 90% red wine of which 80% is A.O.C. Corbieres. The soil is made of schist, limestone, alluvial river wash and argilo-calcaire. Colline Saint Jean Vacqueyras Rouge is made from 70% Grenache, 25% Syrah, 5% Mourvèdre. Dense ruby/purple color as well as an impressive bouquet of red and black fruits (cherry, raspberry, black currant), licorice, garrigue and pepper. The wine is dense, full-bodied, opulent and impressively endowed with sweet, well-integrated tannins. Harvested by hand. Traditional vinification. Skin-contact maceration for 20 days in cement vats. Ageing: 70% in cement vats and 30% in oak barrels. Pairs well with red meat, white meat, game dishes in macerate sauce and cheese. (raised for a year in 80% concrete tanks and usedbarriques): Full ruby. Lively aromas of ripe red and blue fruit, licorice and lavender are complemented by a suggestion of white pepper. Supple and broad on entry, then tighter in the midpalate, offering juicy black raspberry and bitter cherry flavors and a subtle touch of spicecake. Shows very good depth as well as vivacity, finishing with slow-building tannins and minerally persistence. Viña Siegel is a family operated winery with a well-established tradition and long history. For generations we have been dedicated to the art of crafting wines with strong identities. Our Special Reserve wines represent the union of tradition and innovation in two generations. The grapes are sourced through careful selection of our best vineyards. Their ripe and round tannins clearly express the terroir of Colchagua. Siegel Special Reserve Pinot Noir is Casablanca Valley. This Pinot Noir is characterized by its deep cherry red color with notes of ruby red and aromas of roses and fresh fruit such as strawberry and cherry. 12 months in French oak barrels. Made from 100% Barbera d'Asti. The soil is calcareous with tufa layers. The average age of the vines is 30 years. Vinification in stainless steel at 30 C° under temperature controlled conditions. There is a 5-6 days maceration period on the skins to extract as much color as possible. After the malolactic fermentation is completed, the wine is aged for about 8 months in new barriques of 225 liters before bottling. La Bricca is a deep ruby red colored wine with violet hues. The bouquet is vinous and intense with ethereal aromas (typical of the Barbera grape) and scents of ripe fruit and spices. The wine is full bodied with very pleasant silky tannins. Long and harmonious with a good ageing potential. Food pairing: meat dishes, cheese and charcuterie. Serving temperature: to appreciate the wine at its best, the bottle should be left at least 24 hours at room temperature and opened 1 hour before serving. Color : deep dark red, with blueish hints. Aromas : highly fruity ( raspberry, billberry, blackberry ), floral (violet) and intense with a grilled touch ( coffee ). Palate : melted and concentrated tannins, full bodied, very long fresh finish. Grilled meats, sauce meats, game birds, game rabbits and semi-mature cheeses. "The 2014 Lirac Cuvee de La Reine des Bois is an incredible effort that transcends the vintage and is easily the wine of the vintage from Lirac. Possessing fabulous purity and elegance, with medium to full-bodied richness, classic notes of crème de cassis, caramelized meats, violets and licorice, sweet tannin and a great finish, I doubt it will be the longest lived example of this cuvée, but man, hats off to the team for this killer wine in a difficult vintage! - Jeb Dunnuck"
Cazaux Vacqueyras Cuvee des Templiers 2013 is a blend of 50% Syrah, 50% Grenache. Deep color. Intense and persistent red fruits, spice and violet aromas. Intense black cherry, blackberry, blueberry and cherry flavors. Explosive fruit tannins give the sweet, creamy flavors structure and focus, bright and uplifting on the finish. Enjoy this wine when young with grilled beef and bearnaise sauce, lamb and thyme. After 7-10 years excellent with game meats. This wine is flavorful and complex with a good backbone of acid and tannin. Deep red ruby color. Intense aromas with characteristic peppery notes. Dry, tannic and powerful but with a smooth body. Total aging time was 12 months in French oak, and 12 months bottle refinement. "Plenty of spice, chili and berry character with hints of cedar and dried mushrooms. Full body, firm tannins and a fresh finish. A blend of sangiovese and merlot. Drink now or hold."